As our Blessed Mother heard her Son speak these words, “I thirst,” she would have immediately desired to satiate His thirst. She was attentive to His bodily thirst, but she was even more attentive to His spiritual thirst. As the soldier took a sponge, soaked it in wine and placed it to His mouth, she would have received some consolation from this act of kindness. But she would have also seen great meaning in this act. The soldier was a symbol of fallen humanity and the sour wine was a symbol of our disordered state. But it was precisely our disordered state that Jesus longed to redeem. He did not desire “fresh wine” or “pure spring water.” He desired fallen humanity. He thirsted for us to come to Him in our weakness and sin. Our Blessed Mother would have perceived this powerful symbolism. Jesus still cries out today, “I thirst!” He thirsts for you. Too often we feel that we can only come to Him, to satiate His thirst, if we come in an angelic way. Too often we believe that Jesus only smiles at us when we come without sin. But this is not true. 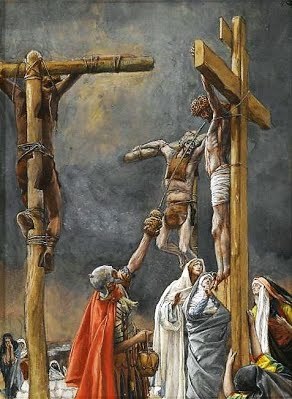 The reason that He died such a cruel death was so that we could come to Him in our own brokenness. We come to the suffering and thirsty Christ with our sin and disorder. We are not fresh wine, we are sour wine. But when we allow ourselves to come to our Lord in this state, His thirst is quenched. What is the condition of your soul? Are you embarrassed by your sin? Do you adopt a false persona presuming that Jesus will only accept you if you are perfect? Nothing is further from the truth. Do not hesitate to come to our Lord with all your weaknesses, struggles and sins. Do not worry about what He will think or say. Come to Him. If you trust Him, your humble act of offering Him your sinful self will refresh His soul. Reflect, today, upon those two sacred words of our dying Lord, “I thirst.” Know that His thirst is for you and that He desires you just as you are. Go to Him, surrender to Him and delight Him. Our Blessed Mother is watching and waiting for you to satiate the longing within the Heart of her divine Son. My dearest Mother, you were attentive to the spiritual thirst in the Heart of your Son. You were also attentive to the fact that His thirst was for me and for all humanity. Pray for me that I may be like that sour wine, lifted to the lips of your divine Son. My loving Mother, pray for me that I may see my sin and may not hesitate to go to your Son in this state. I pray that I may have the courage I need to come in my weakness so as to satiate the Heart of your Son and your own Immaculate Heart. My thirsting Lord, I know that Your words, spoken from the Cross, were words inviting me to satiate Your spiritual longing. Help me to trust that You love me as I am. Give me the courage I need to trust in Your mercy and to turn to You this day. I love You, dear Lord. Help me to love You more.